Alicia will be training a group of teachers and running workshops for parents. 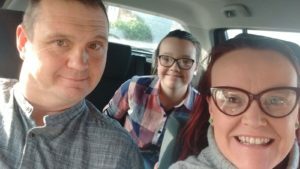 Sioned, her 12 year old daughter, will be running some music sessions for young children aimed at teaching children how to use music to express emotions. Sioned has started a Gofundme page with the intention of collecting donations towards food vouchers which they plan to give to families in Amman. The Blanco-Bayo family will soon be on their way to Jordan. Alicia’s husband Phil will be using his time in Jordan to offer emotional support to men in the community., The family is hoping that they will establish connections so that they can continue to support refugees who don’t make it to Europe and have to start over in different parts of the Middle East. This entry was posted in community, education and training, fundraising, Uncategorized and tagged activism, Edge Hill University by Mike Stoddart. Bookmark the permalink.